Last week, the Czech government proposed a bill, which is now to be reviewed in Parliament. The renewables community is speaking of a step in the right direction, but the battle is still uphill, as a sociologist explained at a conference our Craig Morris attended. Just a few years ago, the Czech Republic suddenly appeared on the international renewables map with a solar boom – one that was quite short-lived. “It was a disaster,” one renewables campaigner stated on Tuesday at a conference on the country’s future energy policy. The bright side is, as a representative of the Energy Ministry pointed out in her presentation, that the Czech Republic has already surpassed its target for renewable electricity (though, as in Germany, less progress has been made outside the power sector). The downside is that the boom led to a bust, and the entire sector is now in limbo in the country. This year, a new government took office – a coalition of Social Democrats (the largest party), Christian Democrats, and a new party created by a billionaire from the media sector (here’s hoping he does not turn out to be the Czech Berlusconi). We do not know what parts of the bill will make it through Parliament, but it proposes, for instance, to do away with the onerous requirement of a permit for all PV arrays, including on small residential rooftops. But the main progress needs to be made in wind power, which only made up 0.6 percent of total supply last year (compared to 14.5 percent at present according to the government’s representative at the conference). “We are leaving out the least expensive source of renewable energy,” one participant complained from the audience. The Czech are also debating the cost impact of renewables as their power prices rise. But one of the presenters showed that the rising rates in the country are largely unrelated to expenditures on renewable power. In the chart below, we see that rates rose by a whopping 65 percent from 1991 to 1992 alone, probably the effect of the country’s transition from communism to a market economy. By the end of the decade, the rate roughly tripled again. Starting in 2002, we see what the effect of renewables is. 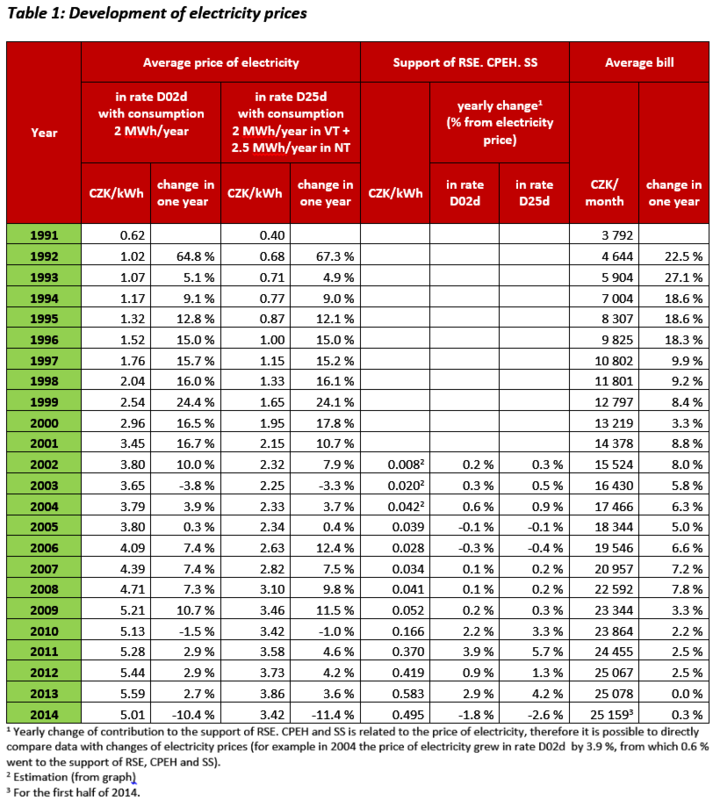 From 2002 to 2014, the price of power rose from 3.8 to 5.0 crowns, an increase of nearly a third. But only 0.5 crowns of that 1.2 crown increase resulted from renewable power. That discussion is also being held in Germany, but another presentation showed how different the Czech Republic is. It took a sociological view of media reports on renewable energy and found that experts who support renewables are depicted as dreamers, whereas experts from the conventional energy sector are described as being realistic pragmatists. With all of the scare-mongering scenarios from German conventional energy experts having been proven false (we will have blackouts if we shut down nuclear power, renewables can never make up more than one percent of supply, etc. ), proponents of renewables increasingly look like more realistic pragmatists in Germany. The conventional experts have been wrong too often – but we only know because Germany gave renewables a go.